This episode Mike and Will recoil in horror from some fearsome home furnishings in ‘The Diary of Mr Poynter’ by M.R. James. Big thanks to our reader for this episode, the mighty Paul Maclean (@ysdc on Twitter). You may know Paul from the ‘Call of Cthulhu’ RPG hub Yog-Sothoth.com and it’s Lovecraftian publishing wing InnsmouthHouse.com. He is also one of the presenters of the News from Pnakotus and The Silver Lodge podcasts, both required listening for weird fiction and RPG fans! Also big thanks to Alisdair Wood, the massively talented artist who provided us with the awesome specially-created ‘Diary of Mr Poynter’ artwork you can see above. 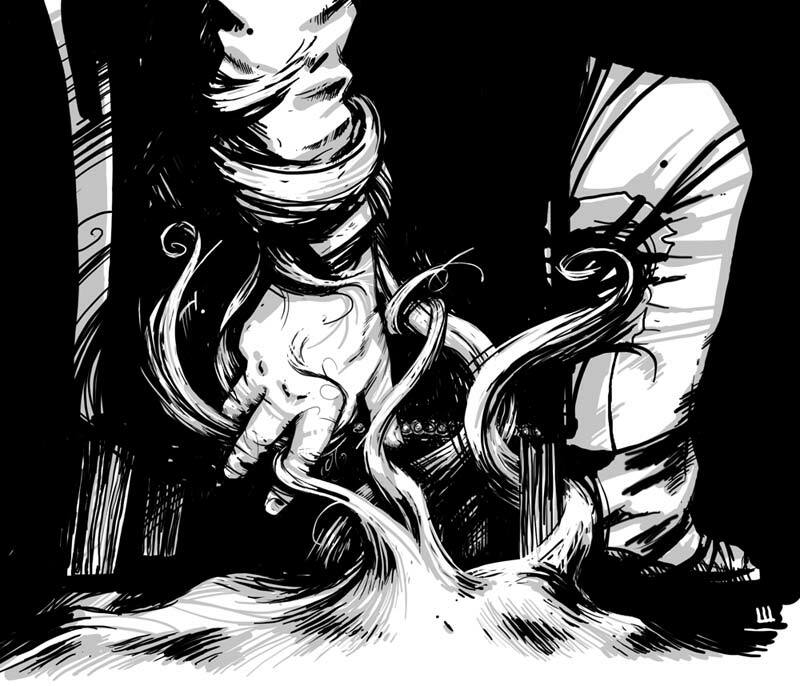 You can find more exciting James-inspired artwork at Alisdair Wood’s website. While in the story Rendcomb Manor is said to be in Warwickshire, the real Rendcomb Manor is in Gloucestershire. Now home to Rendcomb College, it is not clear if James had this ancient estate in mind when he wrote the story. Miss Denton is an advocate of the Anti-vivisection moment, which was gathering momentum in the decade before this story was published. M.R. James borrowed the name of his diarist from an English bishop who published various religious tracts during the early 19th century. Mr Poynter’s diary states that the famously hirsute (and presumably fictional) Everard Charlett was of the same family as Dr Arthur Charlett, who was Master of University College Oxford for 30 years until his death in 1722. James mentions in the story that William Poynter argued with English antiquarian Thomas Hearne (1678 – 1735). Mr Poynter’s diary suggests that there may be precedents for the strange death of Everard Charlett to be found in the work of Robert Plot. Plot English naturalist whose works mentioned strange natural phenomena such as the ‘double sunset’ at Leek in Staffordshire, a giants femur bone etc. James mentions that the curtains are finally delivered on the Feast of St Jude and St Simon, the 28th October. In his book Suffolk and Norfolk M.R. James notes that stained glass images of Jude and Simon can be found in the parish church at Denton in Norfolk, although his use of this as a name for his protagonist could be a coincidence! M.R. James mentions in the story that prior to purchase by James Denton, Mr Poynter’s diary was part of the ‘famous Thomas collection’ of manuscripts. Thomas Philips was an antiquarian and obsessive book collector who left a collection of around 100,000 books and manuscripts at the time of his death in 1872 which were auctioned off over a number of years. Ghosts and Scholars are selling this rather scary bookmark featuring an image of Everard Charlett’s hairy coffin! In the story Mr Cattell makes a reference to ‘Hercules and the painted cloth’, which Rosemary Pardoe suggests may be a hint towards the argument/conspiracy theory that someone else may have written Shakespeare’s works. There are parallels between this story and the short story ‘The Yellow Wallpaper’ by American Writer Charlotte Perkins Gilman which was published in 1892. This story was also recently examined in detail by the HPPodcraft. Suffolk Coast are running a competition for under 16’s to write an ending for M.R. James’s unfinished story Game of Bear. Closing date is 1st November, the winner will be selected by author Susan Hill. Here’s a picture of part of my bedroom curtain. The position of Miss Denton is an unfortunate one – unmarried female relatives were expected to batten onto more successful family members and live at their expense. This means that she would be constantly begging for money, having none of her own; the reason she wants her nephew to buy the fabrics is very probably that he’s the one holding the purse-strings, and she has only a small personal allowance. Saint Jude, supposedly one of the Apostles, suffered historically from confusion with Judas Iscariot. I don’t believe there’s any particular connection between his life and his later patronage. Another approach that occurred to me is that “Absalom’s” hair might have taken on demonic characteristics of its own, and that when he died it took itself off (perhaps to hell or similar). Glad to find another Laundary reader! Yes, the meme theme does give it a very moderm aspect. I was also thinking of the Merchant Prince’s books, with the transdimensional knot-work that can be copied and duplicated, without losing its power. I’d never read this one, and though it sounds like kind of one of Monty’s weaker stories, I also thought of several more contemporary parallels as I heard you describe it. The idea of the dangerous element being carried by the pattern/structure and subject to duplication rather than inhabiting a particular object also made me think of Langford’s stories as well as the “Snow Crash” in Neal Stephenson’s novel of the same name (I didn’t think of the Laundry, but that too). Another more popular iteration of this idea that came to mind is that of the film the Ring, where the haunting spreads by video and can be copied from tape to tape, and even includes a drowned, hairy ghost. I’m not suggesting a direct influence of this story, but it seems more likely that the Diary of Mr. Poynter is an early example of an especially modern take on the ghost/weird tale, where in an age of mass production and reproduction, the hauntings or other phenomena attach to mass-produced or reproducible objects, patterns, or information. While it has always been possible to copy a pattern, this sort of thing may have been more relevant in Monty’s fully industrialized early 20th century, and even more so in the information age, where it’s not even necessary to have a physical object, but just a transmissible bit of information, and perhaps that’s why we can think of so many more contemporary takes on the theme. Of course, this idea of a memetic aspect to the supernatural or weird is not all that different from much more ancient ideas of magic spells, where the effect can be produced by sequences of language, inscribed shapes, etc. that can be written down, and transferred from user to user like computer programs/viruses. Earlier this week I hung some grody floral wallcovering for a client. She loved it. I hope it doesn’t haunt her. I agree the story is a pretty weak one in the cannon, and Alberich is a much better story. My take on it is that the narrative centers around a contrast between woven fibre (chintz, curtains, etc) that are part of Miss Denton’s world and depict her as constrictive, and the unwoven or untangled fibre of the hair, which embodies Denton’s repressed rage over his situation and his desire to be free of his aunt. Even if that’s accurate, MRJ could probably have built a much more interesting story around it. I don’t care for the way the aunt just disappears. Ah, the ghost of HPL may never leave us, eh? I actually agree with you both on this story – it seems quite like James on autopilot, I was incredibly underwhelmed. I didn’t get any sense of threat or lingering fear or even a build up. The face peeking from behind the curtains to the hairy man-thing by the chair (which I will admit did creep me the hell out) seemed very disconnected from each other. It seemed to just appear and be over, instead of putting it’s monstrous foot in the door and becoming more and more prominent. What would have helped this whole rather silly affair (goddamn haunted textiles), I think, would be the inclusion of one of the Denton’s feeling hairy things where hair ought not be around the house, like going for a cup in a cabinet and feeling bristles behind it or something looking hairy, yet upon second inspection is totally normal. The curtains were supposed to be hair looking, which would have been the haunting consistent, I couldn’t visualize. Maybe that was the idea, but it certainly didn’t help me to understand the story. The meme aspect mentioned in previous comments above is actually quite good and damn creepy, but only a supposition – does one have to own an outright physical copy of the design or will a mental image suffice? If the former, there’s an air of ‘Casting the Runes’, that being in possession of the thing causes it to come to you. I liked your suggestion that the wild hair pattern was representative of Sir Everard Charlett’s libertine ways, and repressed Mr. Denton was haunted by the hair because it saw in him someone who subconsciously wanted more freedom. By having the curtain pattern joined at the top, he caused the pattern to be linked to itself, like hair coming together on the scalp (thus making it more life-like), whereas in the fabric scrap, there were no connections at the top or the bottom. As to the mystery of Charlett’s vanishing and returning hair, I’m as puzzled as you. The hair “pluck’d clean off his head” doesn’t sound like the work of hair thieves. It sounds more like the hair left him of its own volition, and later returned and kept growing so that it filled his coffin two years later. But as eerie as that might be, I can think of no reason for it, certainly nothing hinted at in the story. In re-listening to this episode I realized ” joining the bands” referred to the pattern continuing in repetition– tiling, if you will. The top of one instance of the pattern’s cut block joins with bottom of the next instance, creating locks of hair down the entire length of the curtain. That seems obvious in reproducing any pattern, but doing the natural thing led to Mr Denton’s sense of the curtains rippling. There’s another part of the Alberic plot that James recycled: the purchase of the book at a much cheaper price than originally thought. After an evening of attempting to sketch the precise pattern mentioned in the text I can up with the image at http://www.thin-ghost.org/items/show/137 which my missus now wants to have made into an oil (table) cloth. This thing is obviously like catnip for the lasses. It goes without saying that I’m strongly against the idea. Cool picture! The earwigs are a particularly nice/nasty touch. Maybe it’s the reader of the audio version I listened to, but the moment that the protagonist’s mother became enraptured with the scrap of material, I got scared. There’s just a sense of elemental wrongness that permeates it, totally irrational and sinister. The stuff about “I don’t think we should have had them joined up at the top” really makes it build. The comic backdrop is nice and comical, and when the ghost finally makes its appearance, well, I love how it is revealed by its stillness. It doesn’t snarl or rear up at first. It just sits there, as if patiently letting the hero know how screwed he is. I love how weak it is as it tears away. Most of all, I love that M R James was able to make a tale of terror out of something as utterly mundane as selecting a pattern for the new curtains. THAT is skill. I’ve got a little theory as to why the hairy ghost didn’t finish our hero off or pound at the door. I think the amplification of the hair’s pattern, the feeding of the dead man’s vanity, gave it strength, and allowed it to manifest as it concentrated itself together. When the hero opened the door, it couldn’t really follow him because the other rooms and hallways didn’t have that pattern, and it would have dissipated like a small whiff of nitrous oxide in a big open room. It also seems to follow similar rules for a ghostly manifestation as in View from a Hill and Warning to the Curious, what I think of as the Jamesian Shade. There’s another possible explanation of the “painted cloth” problem. Cattell is inclined to soft-soap the customers by making supposedly learned references which are, in fact, utterly ignorant – for example, his remark about medieval things being undervalued/lost. I suspect that he wildly misquoted The Immortal Bard to a customer more pedantic, and less tolerant, than Mr Denton. and was corrected rather sharply. Random remarks about your podcast conversation– The Hamlet quote didn’t strike me as being something James wouldn’t utter because he’s scientifically oriented, but rather totally the sort of thing he’d quote because he’s so spiritual. If nothing else, being so close to the church can only have helped his belief that there are powers we can’t see or explain. The other thought was in regard to the conversation about how the pattern could have power as cloth but not as a photograph, for instance, rather like the mezzotint. My thought was that, like monks illuminating MSS, the people creating the artwork are pouring themselves and their creative talent into the manufacture of the object in question (probably the Dollhouse too, later). That sort of creation is more than just hand craft but as any artist would tell you it includes a little bit of one’s soul. So the craftsman making the wood block with his art and his hands must have put just enough spiritual power into it to bring it to life again and give the ghost a portal. Or something. There was probably a less-pompous way to say that but it’s an idea, anyway!